Steep three minutes in boiling water. (I use a Melitta tea filter; it's compostable.) Makes enough for an enormous mug (my owl mug is 24 ounces). For anything 12 ounces or smaller, halve the recipe. 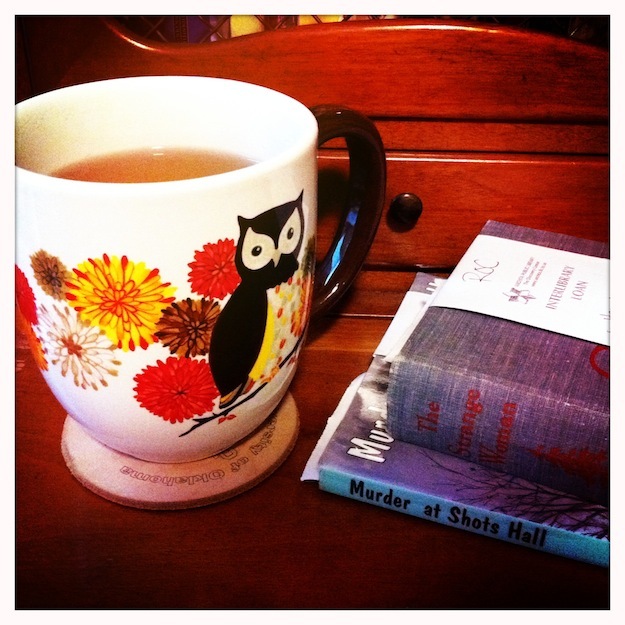 It doesn't necessarily have to be an herbal tea to go with books. You could take it on a walk instead! The Movie of the Week this week is one of my favorites: You Can't Take it With You. It stars the ever-adorable Jean Arthur and James Stewart as a pair of lovebirds (Alice and Tony) from exceedingly different backgrounds. Tony's parents are wealthy, straight-laced, conservative, capitalist and snotty. Alice's entire family all live in the same house (parents, aunts, uncles, cousins, grandfather, friends of the family) pursuing various artistic occupations with no thought in the world for monetary gain. 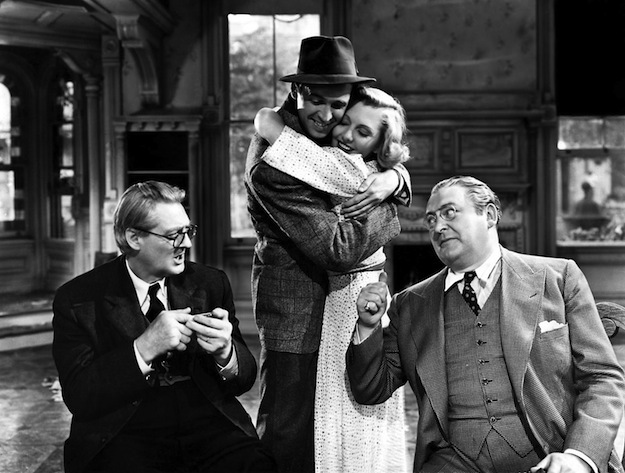 Alice's grandfather, and family philosopher, is played to perfection by Lionel Barrymore. It's a really sweet film with its heart in the right place--a must-see. Two things I love--You Can't Take it With You and inter-library loans! Yay. :) My local library system is terrific, and pretty much every book I've read over the past decade has come from the library. 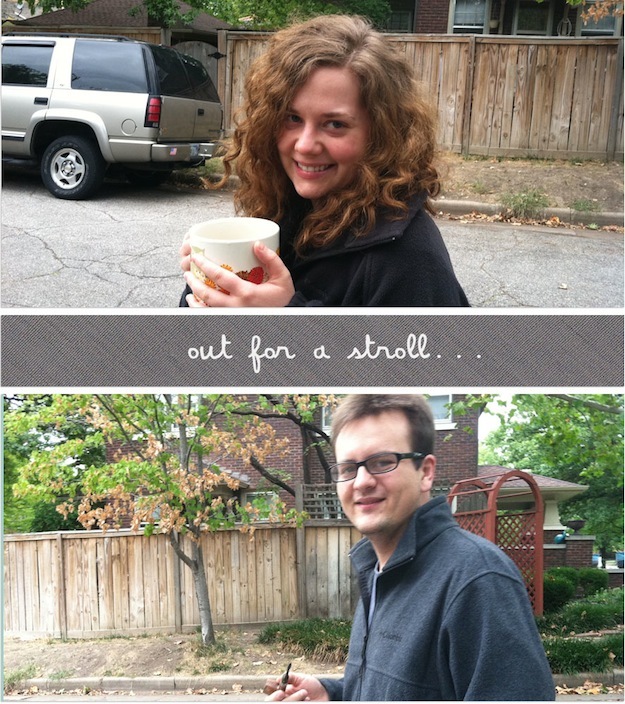 Yay for pictures of blog authors - I love your lovely curls! Karen- ILL is such a wallet-saver. Love it so much--glad you do, too! Oh I have never heard of inter library loans and I am very much partial to a spot james stewart, and you look adorable on the pic what fabulous hair you have! I'm with Hannah- your hair is fabulous! :) Also, I'm obsessed with the public library. We have an excellent one in Boulder and I'm glad you brought up interlibrary loans because I need to take advantage of that more often. I don't think I've seen your owl cup - it's so cute! This is a good movie - your daddy and I watched it sometime recently. You and Paul are darling! For whatever reason I always get this movie mixed up in my head with THE MAN WHO CAME TO DINNER. Don't ask me why as they don't have anything to do with each other except that both feature eccentric families and both were once stage plays. At any rate, don't think I've ever actually seen YOU CAN'T TAKE IT WITH YOU, though I know I must have at some point. I'll check and see if Netflix has it. I love movies about eccentrics. Love Jean Arthur and Edward Arnold too. Yvette- Both The Man Who Came to Dinner and You Can't Take it With You are Kaufman/Hart comedies, which could explain the confusion! Both are available on Netflix (and show up pretty frequently on TCM). Love the new hairdo--such a cute picture. Wait, does this mean you aren't setting your hair vintage style like in your profile picture? Everything about this post is quite nice. :-) I'll have to catch this movie somehow. It sounds so good. Laura- My hair has finally gotten to a length where it can be worn air-dried, which is a bit of a relief! However, I've still got all my velcro rollers and pincurling accessories, so vintage styling is still an option. J- the owl mug is from my grocery store, Dillon's, which is part of the Kroger empire; they have platters and bowls and such, but I really only have room for a mug! Rebecca- I think my Velcro rollers came from Target, Wal-Mart and Sally Beauty Supply. I love the enormous diameter ones--they actually straighten my hair but give it body and movement, as well, with a bit of curl at the end. I only use them if I don't have anything else to do that day, because they take forever to dry and I don't like to use the dryer if I can help it! Haven't used them in a few months. When you liked my hair at Thanksgiving, it was Velcro-rolled. How sad that I remember that! Love the interlibrary loan, love You Can't Take it With You, love your walk with Paul and tea, and especially love seeing this cute pic of you! I'm envious, I spent the late 90s perming my hair to get curls like yours and finally gave up and embraced my straight locks. Sigh! oh I love to go to the library too but i have never tried interlibrary loans yet! I'd love to see this movie because Alice's family is my ideal family! !